Hooray for fall! It's one of the most wonderful times of the year! The morning and evening air is cool and crisp, the leaves are starting to change colors and the days are getting shorter. Why not spend those long evenings at home doing eco-crafts with the kids? It's a fun way to bond after a long busy day at school and a great way to upcycle many different materials that would otherwise be hitting the trash or recycling bin. 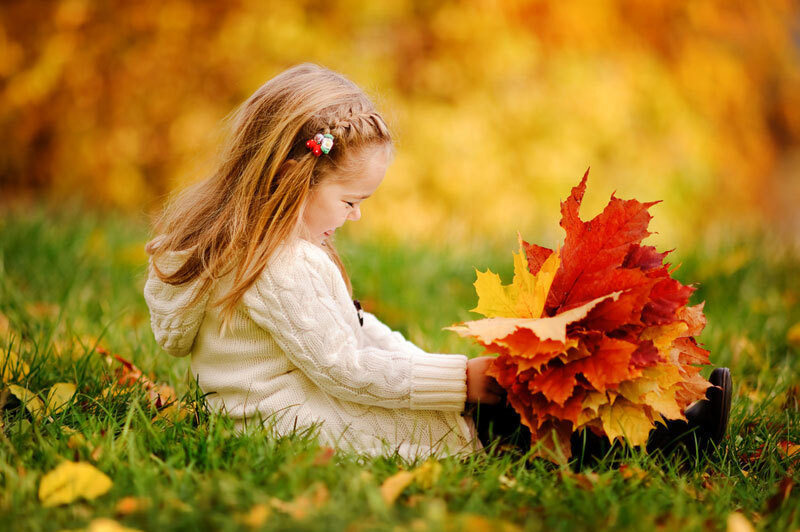 We've rounded-up 10 easy, eco-friendly fall crafts that you can make and enjoy with your kids. So make a cup of hot cocoa, grab your art supplies from the craft closet, hit the recycling bin and get crafting for a fall that's full of fun! Looking for a festive fall dining room centerpiece that can double as a fun activity for the kids? 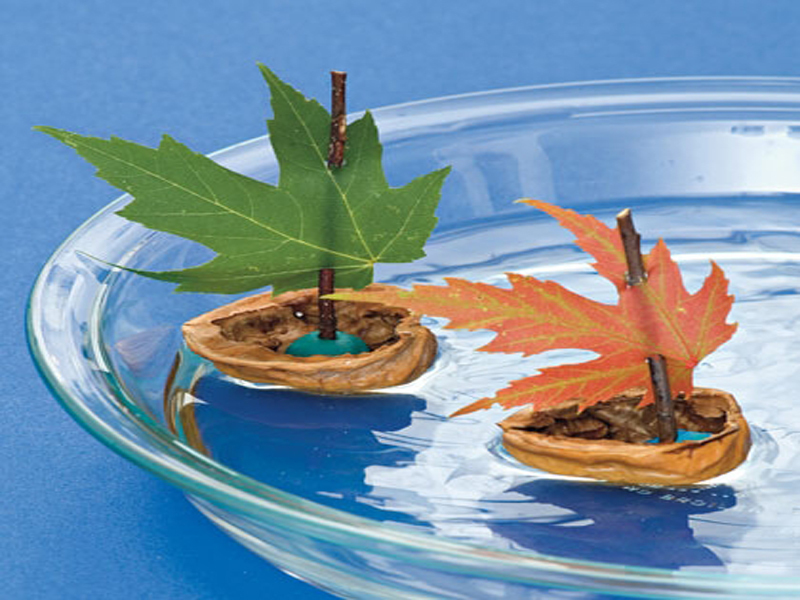 Make these simple leaf and walnut boats for your own tabletop Regatta. This is a craft that will keep children entertained for hours as they race their winning sailboat. If you are like me and have a large jar of buttons in your laundry room – this is the perfect fall craft for your littles! 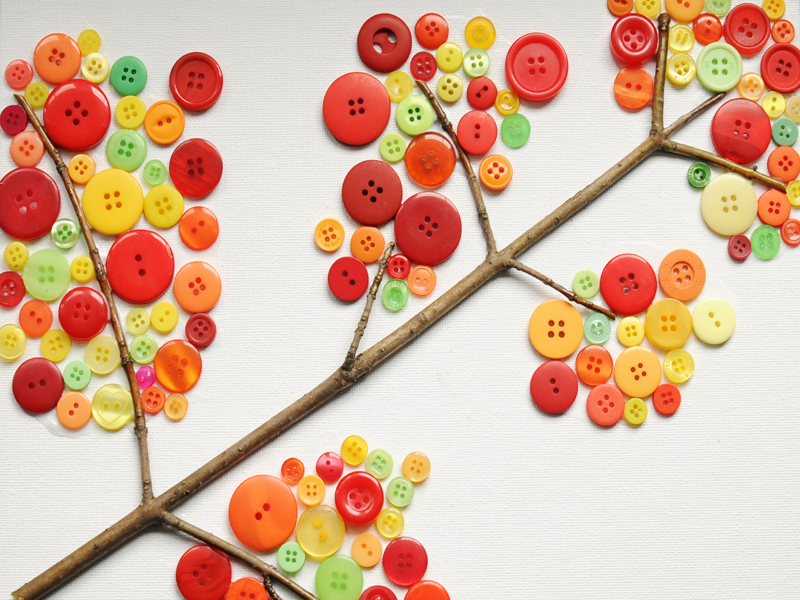 It’s super simple, children of all ages can enjoy it and when you group red, yellow and orange buttons together, the end result is an autumn masterpiece. Fall comes and goes by so quickly, why not save a little bit of it in a memory jar to look back on when the days get dark and cold? It would be fun to add a photo of your family on your fall family trip, then add found items from a fall hike, along with any other memento that reminds you of fall. I have seen a lot of crafts that reuse leftover wine bottle corks – and I have made a few myself. However, these little cork mice might be one of my favorites! I can’t think of a single child who wouldn’t delight in making a set of these little cuties for the upcoming holiday table and mantle. So cute! 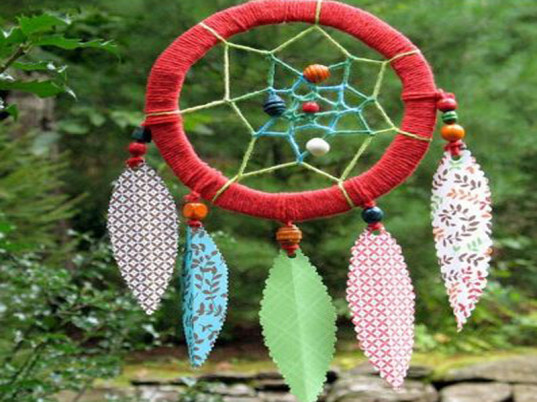 A dream catcher is a fun recycled craft to make with children because you can use many different found trinkets in the design. You can use leaves instead of feathers and it’s a great activity for honing a little one’s fine motor skills. Initials tucked in along with the books of the media center are all the home decor rage right now. Add an eco spin to the craft by wrapping your family initials in fall leaves that your children collect on a day out. 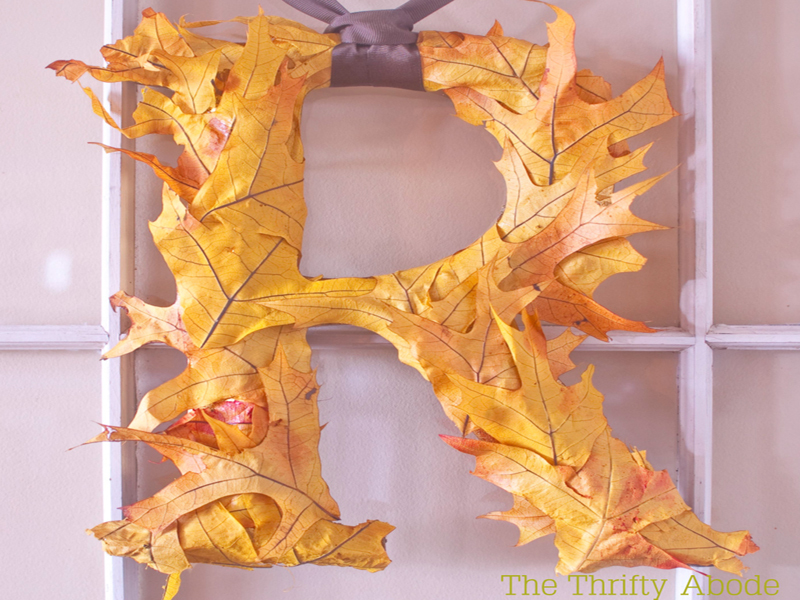 Or if you are looking for initials to keep for the long haul, use fake leaves leftover from last year’s Thanksgiving crafts and get crafting. Once the weather gets chillier and especially when it starts to snow, it’s tougher for birds to find food quickly. 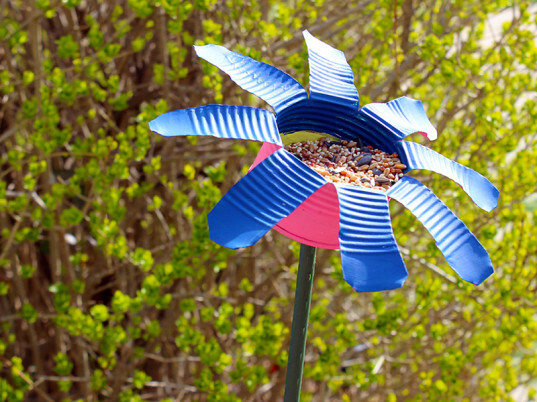 Make it a little easier on the birds by making these adorable recycled tin can birdseed flowers. A set of these would look adorable lining your front flower beds or spread amongst the pumpkins in your backyard garden. If there is one animal that reminds me of fall, it’s the owl. You can find them in many Halloween decorations and they are just so adorable too! These felt owls could be made using leftover scraps of felt and in place of a Styrofoam ball, use another round item that you no longer use. Wouldn’t a set of these look adorable greeting your children each day when they get home from school? 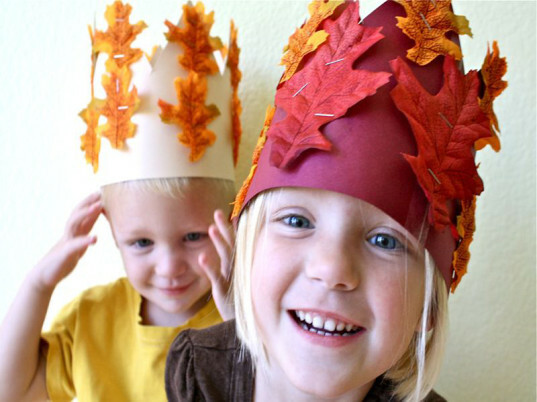 Celebrate fall with your little prince or princess by making recycled autumn crowns. It would be fun to take a fall family hike and collect leaves to make your crown – and then use either a cereal box or pieces of cardboard destined for the recycling bin to fashion the crown. This is a fall craft that all of your children will enjoy – regardless of gender. I am totally smitten with this fall leaf banner – put an eco spin on it by using newspaper slated for the recycling bin or an old book that is headed for Goodwill. 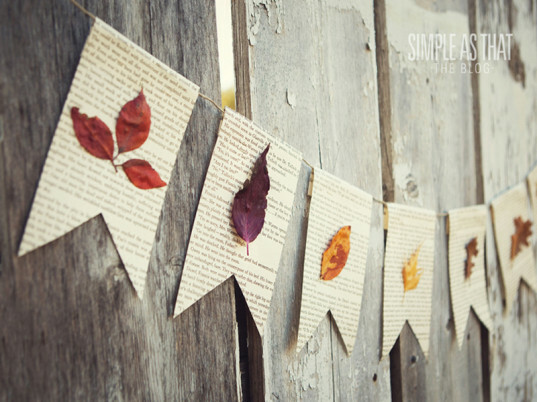 Wouldn’t this be a fun banner to hang to celebrate fall? If you are like me and have a large jar of buttons in your laundry room - this is the perfect fall craft for your littles! It's super simple, children of all ages can enjoy it and when you group red, yellow and orange buttons together, the end result is an autumn masterpiece. Fall comes and goes by so quickly. 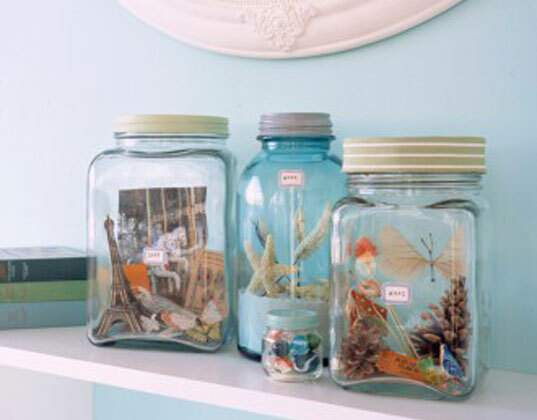 Why not save a little bit of it in a memory jar to look back on when the days get dark and cold? It would be fun to add a photo of your family on your fall family trip, then add found items from a fall hike, along with any other memento that reminds you of fall. I have seen a lot of crafts that reuse leftover wine bottle corks - and I have made a few myself. 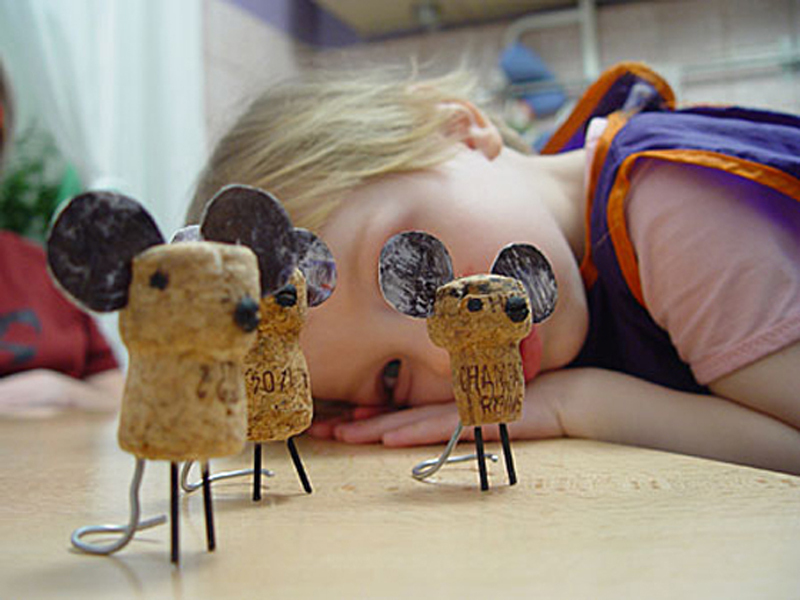 However, these little cork mice might be one of my favorites! I can't think of a single child who wouldn't delight in making a set of these little cuties for the upcoming holiday table and mantle. So sweet! A dream catcher is a fun recycled craft to make with children because you can use many different found trinkets in the design. You can use leaves instead of feathers and it's a great activity for honing a little one's fine motor skills. Initials tucked in along with the books of the media center are all the home decor rage right now. Add an eco spin to the craft by wrapping your family initials in fall leaves that your children collect on a day out. Or if you are looking for initials to keep for the long haul, use fake leaves leftover from last year's Thanksgiving crafts and get crafting. Once the weather gets chillier and especially when it starts to snow, its tougher for birds to find food quickly. Make it a little easier on the birds by making these adorable recycled tin can birdseed flowers. A set of these would look adorable lining your front flower beds or spread amongst the pumpkins in your backyard garden. If there is one animal that reminds me of fall, it's the owl. You can find them in many Halloween decorations and they are just so adorable too! 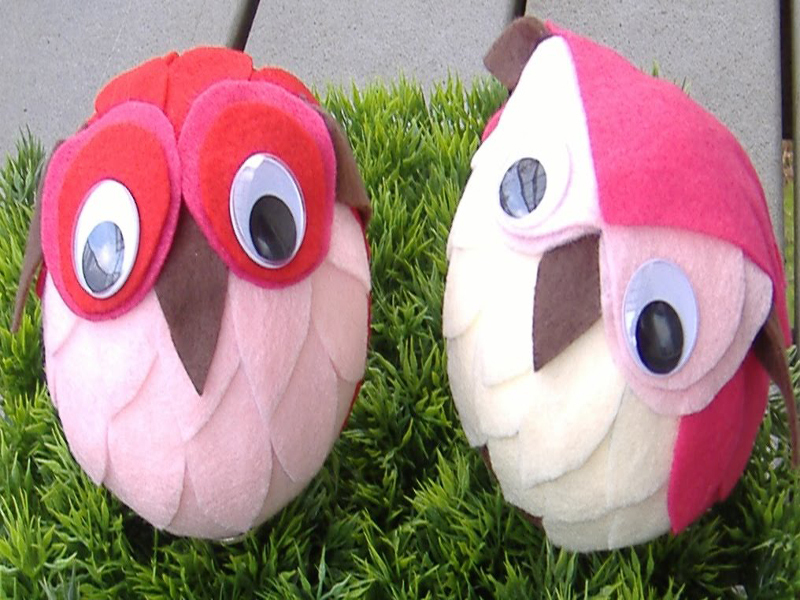 These felt owls could be made using leftover scraps of felt and in place of a Styrofoam ball use another round item that you no longer use. Wouldn't a set of these look adorable greeting your children each day when they get home from school? Celebrate fall with your little prince or princess by making recycled autumn crowns. It would be fun to take a fall family hike and collect leaves to make your crown - and then use either a cereal box or pieces of cardboard destined for the recycling bin to fashion the crown. This is a fall craft that all of your children will enjoy - regardless of gender. I am totally smitten with this fall leaf banner. Put an eco spin on it by using newspaper slated for the recycling bin or an old book that is headed for Goodwill. Wouldn't this be a fun banner to hang for your children to celebrate fall?